“These are the first global measurements of the heliosphere that have ever been made…"
GALACTIC CLOUDS and magnetic ribbons. Such is the ethereal stuff that NASA's Interstellar Boundary Explorer, or IBEX, is out there probing and discovering. The mission, in which Space Science Center researchers are deeply involved, has spent four and a half years imaging the edge of our solar system as well as sampling the raw "star stuff" out of which stars, planets, and humans are formed. The effort has resulted in remarkable and unexpected findings: our solar system appears to be moving through the Milky Way galaxy at a speed and in a direction different than previously thought; and a bright, enigmatic "ribbon" of energy wraps a portion of our sun's heliosphere—the gigantic bubble that surrounds our solar system and helps shield us from dangerous incoming galactic radiation. This image shows the nearest interstellar gas clouds around the solar system, including the Local Interstellar Cloud (LIC) and G Cloud, along with positions of neighboring stars in the plane of our Milky Way galaxy. 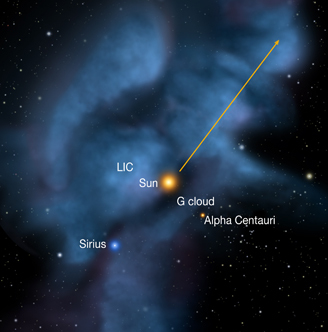 The arrow shows the sun's motion relative to neighboring stars. Image courtesy of P.C. Frisch, University of Chicago. The former finding is crucial for understanding our place in the cosmos through the vast sweep of time—where we've come from, where we're currently located, and where we're going in our journey through the galaxy, all of which has major implications on the size, structure, and protective nature of the heliosphere. 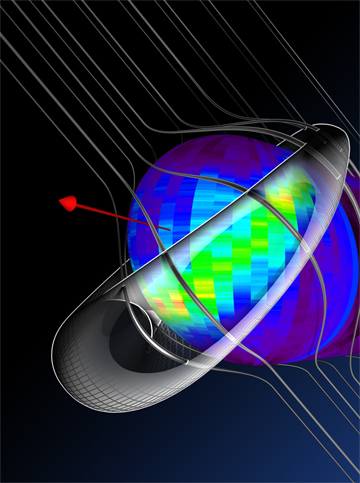 And the ribbon—a discovery analogous to that of Earth's radiation belts and magnetosphere in the 1950s—"paints" an image in the sky of the interstellar magnetic field, a phenomenon that heretofore was completely unknown and also appears to play a critical role in shaping our heliosphere. "We really are discovering how the interstellar magnetic field shapes, deforms, and transforms our entire heliosphere," says Nathan Schwadron, lead scientist for the IBEX Science Operations Center at EOS. "These are the first global measurements of the heliosphere that have ever been made, so in that sense, it is similar to discovering the properties of the magnetosphere for the first time." The initial discovery of the ribbon was not only completely unexpected but had to be puzzled over for three years before astrophysicists came up with a workable explanation of what and why the ribbon was. Indeed, over a dozen theories were put forth before Schwadron, along with mission principal investigator Dave McComas of the Southwest Research Institute, came up with one that, in Schwadron's words, "checks all the boxes, agrees with all the available observations, and matches the mathematical modeling results remarkably in terms of what the ribbon actually looks like." According to this "retention theory," the ribbon exists in a special location where neutral hydrogen atoms from the solar wind move across the local galactic magnetic field. Neutral atoms are not affected by magnetic fields, but when their electrons get stripped away they become charged ions and begin to gyrate rapidly around magnetic field lines. That rapid rotation creates waves or vibrations in the magnetic field, and the charged ions then become trapped by the waves. This is the process that creates the ribbon. A three-dimensional diagram of the retention region shown as a "life preserver" around our heliosphere bubble along with the original IBEX ribbon image. The interstellar magnetic field lines run from the upper left to lower right around the heliosphere. The red arrow shows the direction of travel of our solar system. Image courtesy of Adler Planetarium/IBEX Team. Says Schwadron, "If you think of the ribbon as a harbor, and the solar wind particles it contains as boats, the boats can be trapped in the harbor if the ocean waves outside it are powerful enough. This is the nature of the new ribbon model. The ribbon is a region where particles, originally from the solar wind, become trapped or 'retained' due to intense waves and vibrations in the magnetic field." This explanation appears to solve two important components of the ribbon's mystery: what is the physical mechanism that creates and sustains it, and does it actually exist in space or is it some sort of optical effect? "The theory puts forth the hypothesis that says the ribbon is actually a physical region in space, not an optical effect," Schwadron says. "It's a region where the ions are physically confined roughly perpendicular to the magnetic field." Importantly, Schwadron notes that as spot-on as the retention theory appears to be, it is a hypothesis that will need to be tested and that work towards that very end—including "pencil and paper" mathematical analysis by scientists like the SSC's Marty Lee—is already underway. 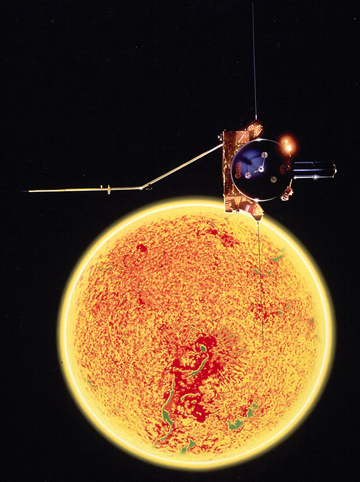 But the biggest test for the theory will come with the passage of time as the sun heads towards solar maximum and the properties of the solar wind change. Since the ribbon is formed from neutral solar wind materials, the presumption is that the ribbon, too, will change. "If the theory is correct, over the next several years we should see some substantial changes in its appearance, particularly in the latitudinal ordering of the ribbon," Schwadron says. The mission's other major discovery—that our solar system is moving through the local galactic medium more slowly and in a direction different than measured previously by the joint NASA/European Space Agency Ulysses mission—has also caused puzzlement. 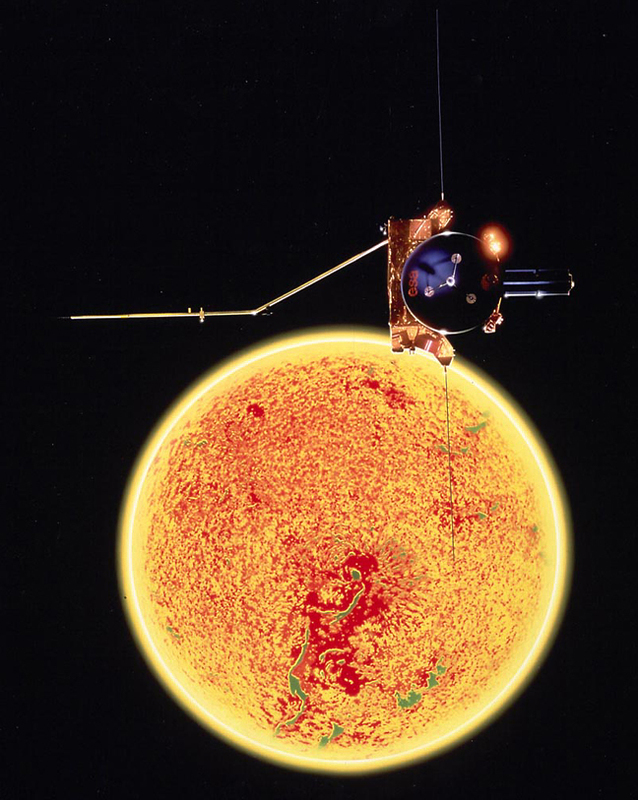 A joint European Space Agency/NASA mission, Ulysses charted the unknown reaches of space above and below the poles of the sun. In an effort to resolve the disparities between the two spacecraft's measurements, IBEX and Ulysses scientists met at EOS for three days in mid-February to compare data and analysis. Among other reasons, sorting this out could help determine in which distinct galactic cloud we are currently sailing through and, in turn, what our place in the universe is. Previous Ulysses measurements of the interstellar gas flow of the galactic medium indicated a faster speed and different orientation of travel, both of which seemed to place our solar system in a region between the two closest interstellar clouds—the Local Interstellar Cloud and the G Cloud, the latter which contains Alpha Centuari, our closest neighboring star three light years distant. 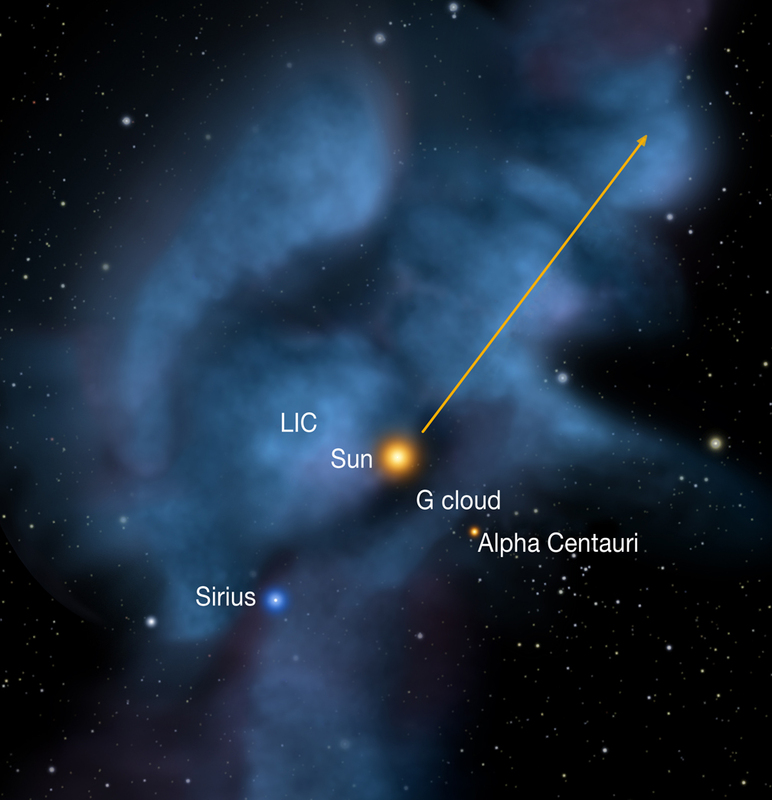 However, IBEX's recent measurements appear to put our solar system into the local cloud, which seems to be consistent with what astronomers have determined by peering through the galactic medium, where they see the solar system at the cloud's leading edge. The spectroscopic measurements through the galactic medium allow astronomers to see what clouds are there and how they are moving. Says Eberhard Möbius, UNH principal scientist for the IBEX mission, "From this, and within certain confidence levels, you can project the temporal paths and determine that the sun has gone through environments where the heliosphere has been very small or very large—all of which, as we have now learned, has a significant influence on the radiation environment of the solar system and, ultimately, our planet." With this cosmic roadmap in hand, scientists can then try to connect the dots through time looking for evidence of evolution of life on Earth, with its ups and downs and extinctions and changes in climate. "This is a focus area of research we've gotten on in just the last ten to fifteen years," Möbius says. The research has opened a new window into gauging the potential habitability of planets in a specific star system that would also have a protective bubble, or "astrosphere." That is, for exoplanets with astrospheres it's much more likely that some type of life has evolved because, like our heliosphere, the bubble would have provided buffering from the full force of galactic cosmic rays while at the same time waxing and waning to allow varying levels of radiation to drive genetic mutations and, thus, the evolution of life. Says Möbius, "Once we understand our own home environment—where we are and have been in the galactic medium—and what controls it, then we can tweak our models and look for other habitable places in the galaxy using much sparser data." Which brings matters back to the disparity between Ulysses and IBEX data regarding where we are at the moment. Could the dueling data be the result of differences in initial measurement, subsequent analysis techniques, or true differences in space and time? Möbius notes that by cosmic standards the space/time difference between Ulysses—a mission that ran from 1990 to 2009 and took interstellar gas data through 2007—and IBEX is a mere nano-blink, and it is highly unlikely that a system operating on the scale of hundreds of thousands to millions of years would vary in any measurable way over the course of a decade. "Is there something in the analysis of the Ulysses or IBEX data that we're doing differently and we don't know it?" Möbius wondered prior to the February meeting with mission scientists. In the meeting's wake Möbius notes, "We looked at potential culprits in observation methods and analysis that could lead to the observed differences in the velocity vector, but haven't found any yet. We need to wait for the next round of data analysis on both sides to be completed for further guidance." Meanwhile, IBEX, parked safely in a uniquely stable orbit, will be providing plenty of additional data through the years to come to both nail down the ribbon retention theory and provide further insights into our current position in the cosmos.